Experiencing pain in your teeth and your jaw but don’t know why? Chances are you need a nightguard. Here’s why. If you’ve experienced the above symptoms, there’s a high likelihood you’re suffering from what we dentists call “bruxism,” otherwise known as teeth grinding and clenching during sleep. This can wear down your teeth and can lead to cracking, chipping of enamel, receding gums and nerve damage. These conditions can in turn merit more serious interventions, like crowns and bridges. Bruxism also causes numerous other problems, like TMJ (temporomandibular joint) pain, earaches, headaches, and even neck aches. While many other treatments have been tested, wearing a nightguard while you sleep is the single best way to prevent these problems. With a nightguard, you may not stop your grinding and clenching, but you will cushion your teeth as they move, as the nightguard will fit over your teeth to absorb the impact. Not only will this help prevent mouth pain and injury to your teeth and jaw, but it should help you sleep better as well. 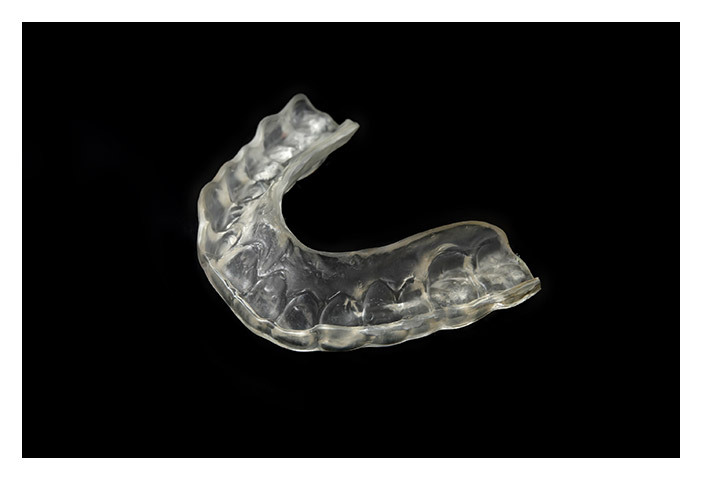 While one-size-fits-all nightguards can be slightly tweaked to fit your mouth, a custom-fit nightguard is the best solution, as it will ensure every tooth is fully cushioned. Getting fitted for your custom nightguard is a simple and fast your process. During your next visit, we’ll make a mold of your teeth and send it out to the lab that will make the guard. You’ll return in 1 to 2 weeks to try the guard on and make sure it fits. Then we’ll send you home for a much better sleep! A nightguard may seem expensive at first glance, but it is covered by many dental plans and it will also prevent you from spending far more later to fix damaged and painful teeth. And if you’ve had any cosmetic dentistry done, you also want to make sure you protect your investment. You’ll sleep better — and feel better — with a nightguard to combat teeth grinding and jaw clenching. Contact DHG today to schedule your custom fitting!